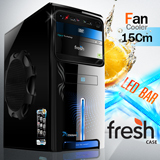 • ATX CASE Size and Power Supply 500 Watt (24pin) SATA 2 IDE 3 heads head • Case size 15cm fan. Power Supply500 Watts. 8cm. Blower side 1Fan 15 cm. Length of 400 mm., Width 180 mm. Higher 410 mm.IDE Port3 PortsSATA Port2 PortsSlot HDD2 SlotsSlot CD / DVD ROM2 SlotsUSB 2.02Ports With HD AUDIO accommodate Card ReadeMaterialSecc.